The Tutankhamun London exhibition includes information, housed in galleries, based on various themes including Tutankhamun King of Egypt. 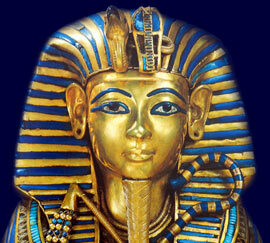 Comprehensive facts and information on Tutankhamun King of Egypt can be accessed by our sitemap. But this page details fast facts and info that we hope will 'wet your appetite' for Ancient Egyptian History and the Tutankhamun London Exhibition including Tutankhamun King of Egypt. Fact 2 The people and the priests resented the new religion which had been forced upon them. Egypt had declined into a chaotic state, governed by the religion obsessed Pharaoh Akhenaten and the corrupt officials who had replaced the traditional priest led economy. Fact 5 When King Tut was about 12 years old the backlash against the new religion was so intense that the young pharaoh changed his name from Tutankhaten to Tutankhamun. Each section of the King Tut website addresses all topics and provides interesting facts and information about the Golden Age of Pharaohs and of Egypt London Exhibition. The Sitemap provides full details of all of the information and facts provided about the fascinating subject of the Pharaoh Tutankhamun and the Tutankhamun King of Egypt.